374 years have past since Robert Daniell left the shores of his homeland in England for a new beginning in Massachusetts Bay Colony. Like the majority of those who arrived in the Watertown area in 1635-36, Robert and his family came from an area of England known as East Anglia. Comprised of three counties Norfolk, Suffolk and Essex and situated northeast of London, the area was filled with industrious, independent minded people. Driven to the Colony for many reasons, the majority either followed or were influenced by charismatic Puritan ministers who lead their flocks to a land free from the persecution of King Charles' emboldened Archbishop of Canterbury, William Laud and his contemporaries. It's no coincidence that the arrival of Laudian Matthew Wren as the bishop of Norwich in 1635 coincided with the decision of many additional nonconformist Puritans to leave East Anglia for the colony which allowed freedom to practice their faith. Certainly there were other contributing factors including a failing economy, overcrowding, leading to food shortages and waves of disease, however, religious persecution could not be escaped by moving anywhere in England. August 4, 1633 Elizabeth, daughter of Robert and Elizabeth was christened at the church in Earles Colne. In the winter of 1634/35 the Daniell family consisted of Robert, his wife Elizabeth Morse Daniell and two young children, Samuel and Elizabeth. Deteriorating conditions forced the Daniells and Elizabeth's parents, who lived in Burgate,Suffolk to consider leaving England for Massachusetts Bay Colony. As with so many others who left England, the migration to New England would include a group of family members. While it's impossible to confirm, evidence shows that it was during this time that the Daniells made firm plans to leave for Massachusetts Bay. Elizabeth's brother, Daniel Morse had already left for the colony arriving in Watertown in 1634, where he was admitted freeman, 6 May 1635. Information from him would have provided a reliable report of conditions and opportunities that would await the Robert Daniell's family and Robert's in-laws Samuel and Elizabeth Morse. Circumstances surrounding the decision to leave can be tied to several things. Robert's in-laws were no strangers to the difficulties faced by religious leaders of the time regardless of their affiliation - Church of England, Catholic or Puritan. For over 100 years the English were forced back and forth between one religion or another depending on who was wearing the crown. While some could remain insulated from the vacillating conditions those who served as clergy could not. Samuel Morse was born the son of a minister, Reverend Thomas Morse, who served the congregations at St. Peter's Boxted, Essex, Hinderclay, Suffolk and finally at Foxearth, Essex. Carrying on in the steps of his father, Samuel's brother, John trained at Cambridge's Emmanuel College that was known as an incubator of Puritanical ministers. Pressure was mounting on the area's Puritan population with the promotion of William Laud as Archbishop of Canterbury in 1633 by King Charles I followed by the ascension of Matthew Wren as the areas Bishop (father of the soon to be famous architect Christopher Wren who rebuilt London's St. Paul's Cathedral) it was time to leave. Both made it clear to all nonconformists that they would be persecuted if they continued to practice their faith outside the doctrines of the official church now in power. Religious conflict wasn't the only problem effecting Robert and his extended family. Economic conditions had been deteriorating for the East Anglicans ever since England had entered into the 30-year war in 1618. Crop failures in 1629-30 and the complete disruption of exports of the regions cloth and fine fabrics sent the region into an economic depression. Conditions were ripe for change. A move to the colony would provide for an unprecedented opportunity to change one's fortunes. Colonial towns provided the potential to own land by some other means other than inheritance or out right purchase. Although no guarantees for success were attached, the colony's population was growing by leaps and bounds and that brought on added security. And in the Daniell's case the move would be with Elizabeth's side of the family. It was time to move. Robert's in-laws were the first to depart taking their son, Joseph Morse and Robert Daniell's young daughter, Elizabeth. Stopping in Earls Colne along their way they traveled a 107 miles overland from Burgate, Suffolk to the ship docks in London. They and an accompanying cart containing their belongings arrived on or about April 15th, 1635 when they registered for travel aboard the tall ship, Increase. The Increase was one of 18 ships to leave London for Massachusetts that year. Two days after the family checked in, the last of the 117 men, women and children had arrived and ships Master Robert Lea guided his vessel down the River Thames and out to sea. Arriving first in Boston, the Morses and young Elizabeth Daniell were among the 1,178 passengers who would make the voyage from London to the colony in 1635. From Boston the Morses traveled the final 10 miles of their migration to Watertown where they would await the arrival of the family of Robert Daniell. Note: There continues to be debate as to whether or not Elizabeth Daniell's parents are the Samuel Morse family who resided at Redgrave and Burgate, Suffolk, England. The passage of the Daniell family: Robert, Elizabeth, Samuel and now most likely their infant son, Thomas, is not recorded in any known manifest. However, recorded events point to a departure in the early spring of 1636. The journey from Earls Colne to the gangway of their tall ship came after a particularly bitter winter in East Anglia. During the Great Migration groups of ships crossed the ocean together to safeguard against Dunkirkers and other privateers hiring on with anyone who would have them as well as other dangers presented by the vast ocean. It's appropriate to assume the Daniell family were aboard a ship in the large fleet that arrived in the colony prior to May 15th that spring. Some speculate that Robert and Elizabeth delayed their voyage due to her likely pregnancy with son, Thomas; however it's even more likely that Robert was put in charge of divesting of property and settling any remaining issues for himself and any other family members prior to his departure. The final few miles the Daniells traveled up the Charles River to Watertown where the Morse's had been awaiting their arrival. It must have been a joyous reunion bringing young Elizabeth to the arms of her mom and dad. During the year long wait for their arrival the Morses established a home and joined the Watertown church of George Phillips. Phillips had come from service at the church at Boxted. The very same churches where Samuel's father, Thomas had served minister and Samuel had been baptized as a child. Lead by Phillips, the Watertown church was founded on July 30th 1630 was unique in its desire to remain isolated from the other congregations in the Colony. The isolation may have been a reflection of Reverend Phillips desire to keep himself and his congregation free of the influence of church leadership and other more seemingly charismatic ministers. Shortly after the Daniell's 1636 arrival the Morses quickly made a move west to a newly established town of Dedham, Massachusetts leaving Robert, Elizabeth and family behind at Watertown. Samuel and his son Joseph were recorded as participants at a meeting of the proprietors of Dedham on August 15, 1636. Samuel was elected to public office prior to his joining the church. This was unusual and may lead one to the conclusion that he was recruited to move to Dedham with the offer of a leadership position in the community. Note: It was in Dedham that Samuel Morse would come to know Jonathan Fairbanks. Who would have guessed that 30 years later, Robert Daniell's son, Joseph would marry Jonathan's grand-daughter, Mary at the Boggastow Farms in Medway as described in Generation II. Robert and Elizabeth decided to remain in Watertown after learning about town plans to divide approximately 3000 acres among the townsmen. Grants of land the size of these were unprecedented in the colony and for that matter nonexistent back of in England. This provided the Daniells an opportunity to obtain land and for the time being, establish a homestead in the town. The first record documenting Robert Daniell's presence in the Colony occurred when the town's freemen allotted parcels of land to the 120 Townsmen of Watertown on July 25th, 1636. In what was called the second division, Robert received a 35-acre parcel located between John Smith's 35 acre plot and Edward Goffe's 60 acres. 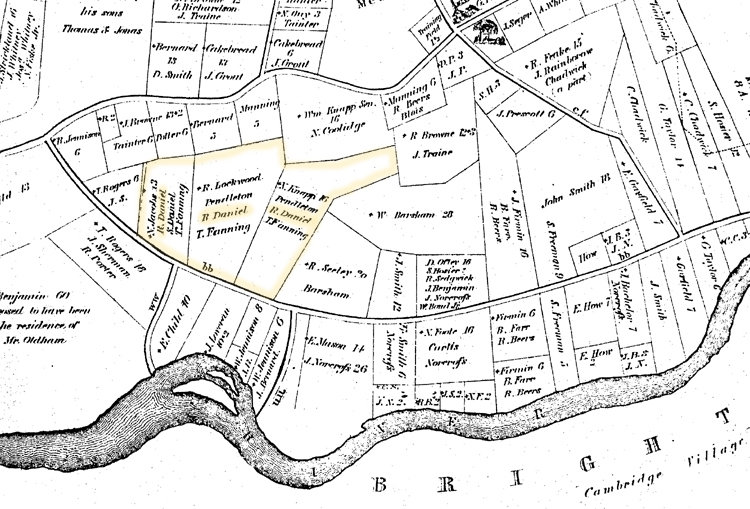 The allotments were bounded with Newtowne, (Cambridge) on the north and the plow land to the south and were laid in succession, one after another. Allotments varied in size from 25 to 80 acres and all were described as being 160 rods (1/2 mile) in breadth. Freemen provided additional land for cartways and meadows for use by all in common. Note: Based on the general lot description in the Watertown Land Grants and Possessions record, Robert's land would have been 1 mile wide and 385 feet deep. The Freemen of Watertown met again the following February, this time to distribute what was described as plow land referred to as the Beaverbrook Plane. This area consisting of meadowland and upland was divided among the 106 townsmen. The population had decreased since the first allotment the previous summer. The Freeman had come up with a new plan that divided land based on formula that tied grants to family and cattle ownership. Grants were divvied out at the rate of 1 acre of land per person in the household plus 1 acre per head of mature cattle. Robert received 8 acres of land, allotment number 68. That comes to one acre each for his wife, Elizabeth, son's Samuel and Thomas, daughter Elizabeth and himself and 3 cattle. The lots granted were in succession with the first lot bordering the northern bank of the Charles River and all remaining lots to the north of that one. Incidentally, a new member of the community arrived in time for this allotment - Mr. Edmund James. His wife Reana would eventually become Robert's second wife 17 years later. Edmund's 5 acre lot was 7 parcels to the north of Roberts. On June 16, 1637 the Freemen gathered once again to grant additional land to the townsmen. This 3rd recorded division of land was in an area called the remote or west pine meadows. The number of households in Watertown had increased by 7 to a total of 113 in the past 4 months. Like the February allotment, land would be based on an acre of land for each person and number of cattle in each household. Robert received 8 acres, indicating no changes in family or animal population since the February meeting. In just 11 months Robert's land holdings now stood at 51 acres. There were two additional allotments recorded in the Watertown Land Grants and Possessions records. Neither grant included allocations to Robert. The first took place on April 9, 1638 where 40 townsmen were granted small parcels of land, in what was called the Town plot. No further description of how one qualified was provided in the record. The second and most significant allocation of land occurred on June 10, 1642. Recorded as the 3 month 10 day in 1642 it's important to translate the date to the Gregorian calendar in use today. This grant provided all townsmen who did not already have farms allotments at the rate of 13 acres of upland for every person in the household and head of cattle owned. Grants over 100 acres were common and a few over 200 acres in total. Land ownership in the early days of Watertown's development was a bit like trading baseball cards. Freeman allotments were based upon wholesale divisions of large parcels of land not the individual wants and needs of the recipients. Many early settlers found reason to sell their allotments and buy land more appropriate to their requirements. Those who chose to leave the town might or might not sell their lands. In Robert's case it's clear that he maintained possession of his lands in Watertown after moving his family to Cambridge. Over time, Robert Daniell purchased a 13 acre lot from Nicholas Jacob, and later purchased two additional adjacent lots from Brian Pendleton and his wife Eleanor bringing together a contiguous 45 acre estate. Located along a bend in the Charles river just upslope from a crescent shaped island this configuration of land ownership was recorded in a map drawn in later years by Dr. Bond. Early town development in the colony is clearly explained in Sumner C. Powell's, Pulitzer Prize winning book titled PURITAN VILLAGE The Formation of a New England Town. One of the personalities Powell's book follows is the same Brian Pendleton that Robert bought the lots from. Pendleton, an important figure in early Watertown had come from London and was influential in the development of the town. The circumstances surrounding his decision to sell his holdings and become a cofounder of Sudbury, Massachusetts can be reviewed in Powell's book. While living in Watertown, Elizabeth gave birth to a third son, Joseph, in 1638 who was to become my 6th great grandfather. Sometime prior to March 14 in the year 1639 , Robert Daniell gave a public confession before the congregation of Thomas Shepard. It was a requirement of all but the very first members of the church that a public confession be orated before the church body prior to admittance to the church membership. 51 of these confessions were recorded by Reverend Shepard as they were delivered in a small leather covered notebook. Note: Michael McGiffert's book titled GOD'S PLOT Puritan Spirituality in Thomas Shepard's Cambridge provides the reader a comprehensive view of the life and times of Shepard and his followers. Robert Daniell's confession (and a brief but defective biography of him) along with autobiographical writings by Shepard are well organized for those who are interested in knowing additional background. Robert Daniell and 42 other men appeared before the General Court while in session at the church in Newtowne, recited the freeman's oath and received the title of freeman of the Colony on March 14, 1639. Note: Becoming a freeman was limited to a fraction of Massachusetts Bay Colony citizenry. Historians familiar with that period write that as few as 1 in 10 of the colony's inhabitants were qualified to take the oath of a freeman at the time Robert did. The "General Court" had voted to limit the title and rights of a freeman to church members only on May 18, 1631. This change occurred just 7 months after the first "heads of families", church members or not, were bestowed the title and rights of a freeman. The next mention of Robert Daniell comes from the Proprietors Records at Cambridge where a real-estate transaction was recorded September 21, 1639. Robert moved to nearby Cambridge having purchased the home of Thomas Blogget who had died August 7, 1639. It's not clear if the actual transaction occurred prior or just after Thomas' death. It's likely that the Blogget's and Daniell's were acquainted with each other prior to the purchase of their home in Cambridge. Four years earlier, Thomas Blogget, his wife Susan and their two sons, Daniell, then age 4 and Samuell, age 1 , traveled to the colonies aboard the same ship (Increase) as the Morses and Robert's 2-year-old daughter, Elizabeth. Note: The name of the town was changed from Newtowne to Cambridge by order of the General Court May 2, 1638, after it was determined that Harvard College would be built there. Additional reasons for the name change included the honoring of several citizens including Thomas Shepard (Emmanuel College, Cambridge University) who were educated at Cambridge, England. The Daniell home in Cambridge, located 3 miles from their property in Watertown, was situated upon the Common on the westerly side of Garden Street complete with a garden and a 1 acre backyard and outhouse. His neighbors were: John Bridge to the south with a 12 acre farm complete with barn located on the highway to Watertown; Thomas Parrish, (who also arrived aboard the Increase) who owned a 4 acre plot to his west; Gilbert Crackbone, on an acre backyard north of his property; and the Cowe Common to his northeast. The following depiction of 1638 Cambridge was written by Professor, Arthur O. Norton in his contribution to the History of Massachusetts published in 1927. "May we pause for a glance at the New Cambridge (Newtowne) of 1638. It was in painful contrast to Old Cambridge, - the English university town with its ancient, even stately college buildings which so many colonists had known. 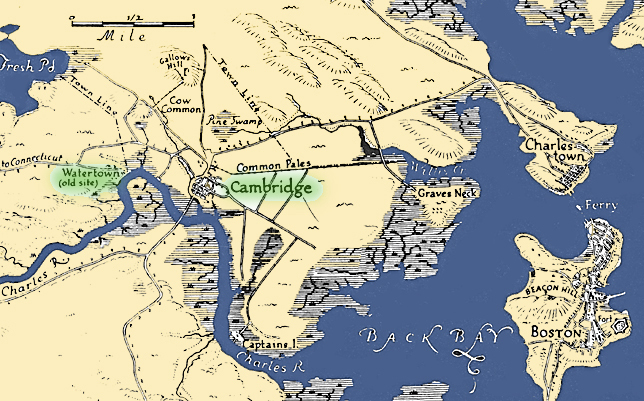 New Cambridge was but a little village, scarcely 300 yards from north to south and 400 yards from east to west on the northerly bank of the Charles River, three miles west of Boston. Its area was divided by four short streets parallel to the river, crossed from north to south by four others. Its boundaries are now marked on the east by Holyoke Street; on the west by nearly semicircular way through Harvard Square, Brattle Square and Eliot Street; on the north by Massachusetts Avenue eastward from Harvard Square; and on the south by the (then) marshy banks and muddy tidal flats of the Charles River. Within the area were forty or fifty unpainted wooden houses with shingled roofs. A little church of hand-hewn logs, stood near the center of the village. Extending eastward from Harvard Square in what is now Massachusetts Avenue was a row of houses which formed the northerly limit of the town." Robert and his family now resided in a small but very important village. In 1640, Robert and his family must have been filled with fear and excitement when they watched the next-door neighbor's, house, belonging to the Crackbones burn to the ground. Fortunately, the Crackbone family was spared death and injuries and the home was rebuilt. The confession of Mrs. Crackbone before Thomas Shepard's congregation later that year mentions the event as being a catalyst to her renewed faith in God and caused her to seek membership in the church body. In 1646 the Crackbones sold their home to Philip Cook and moved from the area. Note: Fires were always a concern in Cambridge and throughout the Colony. Cooking was done in a large fireplace located within the kitchen and cooking coals were rarely completely extinguished between uses. In the hot summer months the coals would be buried to diminish the amount of heat produced between meals but the danger of an unattended fire always remained. In addition to cooking with open flames, fires would be kept ablaze throughout the cold winter months to counter the extreme temperatures of the New England winters. After the move to Cambridge, two additional children were born: Sarah , their second daughter, about 1640 and a third daughter, Mary, on September 2, 1642. Records show an annual town meeting was held on the first Monday of November 1640 to select all town officers and additional appointees. Robert Daniell and George Hotchins were chosen as Surveyors "to mend the highways for the year" and were appointed the same duties once again at a meeting on November 8, 1641. In addition to the obvious, Robert and George were given authority to insure that property owners kept "the street clear of wood and all other things against his own ground" or be faced with a fine of 5 shillings for each occurrence. October 2, 1643, Robert's wife, Elizabeth Morse Daniell dies. Elizabeth was 37 years old having been born in Redgrave, Suffolk, England (East Anglia) on March 6, 1605/06. She was buried at the Cambridge Burying Ground which is next to Christ Church and across Garden Street from Cambridge Common. Note: Elizabeth's grandfather, Reverend Thomas Morse ministered in three East Anglia locations during his life; Boxted, Essex 1573-1578; Hinderclay, Suffolk 1583; and Foxearth, Essex 1595-96. Thomas was serving as Rector at the Church at Foxearth , Essex, England when he died shortly after the 10th of November in 1596. Thomas Morse will was probated in London April 28, 1597. May 1644, Robert Daniell sold his home and property in Cambridge to Nicholas Wythe who incidentally gave his confession before Thomas Shepard's church on January 2, 1645. Note: Information obtained from the Cambridge Historical Commission indicates the Wythe home was located at 22 Garden Street across from Cambridge Common. Reverend Lucius Paige's book the History of Cambridge states that the Wythe family retained continuous ownership of the home over the next 200 years. Just one year after the death of wife, Elizabeth, tragedy struck once again with the death of Robert's 9-year-old son, Thomas. He was buried at Watertown November 6, 1644. Why bury Thomas at Watertown? I have no logical reason to explain why; however, respected recorded histories, e.g., James Savage's book, Genealogical Dictionary of the First Settlers of New England, do not reveal additional settlers with the surname of Daniell, Daniel or Daniels prior to the time of Thomas's death. It is, therefore, unlikely that additional evidence will be uncovered to support any other conclusion than Thomas is Robert and Elizabeth's son and that it is he who was buried at Watertown in November of 1644. September 8, 1647, Robert Daniell, Gilbert Crackbone and John Coop[e]r were chosen as Surveyors "to mend the highways". This would be the third time Robert would be asked to serve in this capacity. My interpretation of the records has Robert with his 5 living children, Elizabeth, Samuel, Joseph, Sarah, and Mary moving back to his first home and property in Watertown sometime prior to his appointment as the Watertown Constable in 1651. This theory is based on the fact that no real estate or other records provide us with any other logical reason for Robert's appointment to a Watertown position. By this time, Robert, a prosperous farmer who owned many acres of land (will inventory) scattered through out the Watertown and Cambridge areas. The original lots and, we must assume, home remained under his ownership until his death. January 20, 1649, Robert Daniell purchased all of Brian Pendleton's Watertown holdings (which he had purchased from Robert Lockwood and Nicholas Knapp in Feb. 1646) for 83 pounds. 1651, Watertown records show Robert serving as constable. November 12, 1652, It was "agreed that Michael Berstow and Hugh Mason shall view the foot path through Goodman Daniell's ground and speak with him about his insufficient stiles." [WTP Page 28] Stiles, a step or series of steps were used to cross over farm fences continue to be used today in 21st century English farms. May 2, 1654, Robert married Reana Andrews in Cambridge. Reana had been married twice before, first to Edmund James, (d. after 3/24/1639/40) of Watertown, and second to Master William Andrews (Andrewes), (d. 1652) of Cambridge. Robert Daniell and the Andrews were well acquainted through their association at Thomas Shepard's church. Robert and Reana made their home in Cambridge. August 4, 1654, Robert was taken to task by Watertown's selectmen for not maintaining his property in a way as required by Watertown ordinance. The matter was taken up again on September 21, 1654 at a general meeting resulting in a decision that disapointed Robert. Actions such as this by selectmen were quite common during this time period and do not indicate a particular lack of respect for authority by Robert. May 17, 1655, Daughter Elizabeth, then 22, married Thomas Fanning. July 6, 1655, Robert Daniell died. The remaining children in the home at the time of Robert's death were Joseph, 16, Sarah, 14, and Mary, 12. While no official record or marker remains, Robert and his first wife Elizabeth were buried at the Cambridge Burying Ground bounded by Menotomy Road (Massachusetts Avenue) and Garden Street. This cemetery, the second one designated for use in Cambridge was first used in early 1635-36. Source, The Cambridge of Eighteen Hundred and Ninety Six, Chapter titled Burial-Places in Cambridge, George S. Saunders, Chairman of the Cambridge Cemetery Commissioners, 1896. The following is a transcript of Robert's last will and testament as transcribed from the original 17th century document signed and dated July 3, 1655 and proved October 2, 1655 in Cambridge: Middlesex Probate Records 1:61-63. IN THE NAME OF GOD AMEN the third day of July In the year of our Lord God one thousand six houndred and fifty five. I Robert Daniell of Cambridge in New England, although weake in body yet of sound mind and good understanding do make and ordeine this my last will and testament, my poare immortall Soule I do leave in the Everlasting armes of the mercyes of God the Father in Christ Jesus. And as for my outward estate wherewith the Lord hath bin pleased for to blesse me and for a short time to make me steward of, my will is that my funerall expenses being first discharged that it shallbe thus disposed of as followeth, vzt. Unto my Loving wife Reanna, over and besides that part of the estate which I received with her uppon my marriage to her which be covenant was to returne unto her againe at my decease, I do give forty shillings a yeare dureing her life to be payd the one halfe in fruite [illeg.] aples etc. and the other half in foure bushels of wheate, my will is that my household goodes be Equally devided amongst my five Children viz to Each a fift part also my will is that my Eldest daughter the now wife of Thomas Fanning shall have her fifth part Immediately after my decease and the remainder to remaine with my Soone, Samuell untill the rest of his Bros. And sisters shall come of age, of Twenty one yeares or mariage which shall first happen. Also I do give to my Cousen Anna Newcomen a young Cow and to Elder Frost forty shillings; Also I do give unto my daughter Elizabeth the wife of Thomas Fanning fifty pounds, to be payd in Cattle and corne at or before the first of May next. Also I do give unto my three youngest children fifty pound a peece, to be payd when they shall come to the age of Twenty one years: with in one whole yeare after their mariage which shall first happen, or before if my Executors shall desire the same, The remainder of my estate I do give and bequeath the whole and entie [sic] part thereof whether Reall or personall unto my sonne Samuell. Whom I do nominate as my Executor to gether with my sonne in law Thomas Fanning and my Loveing Friends Richard Jacson, and Thomas Danforth, I do hereby ordeine and make my Supervisors to see this my last will and testament faithfully Executed according to the true Intent and meaneing thereof, to hwom I do also in Speciall comitt the care [and] dispose of my children, both in their minority and in [the] change of their condition by mariage, also my will is that if [it] happen any of my children to decease before their mariage or their Arivall to the aforesaid Age of Twenty one years that then the portion of su[ch] the deceased shalbe and remaine to such as shall survive and be Equally devided Amongst them to Each survivor alike proportion. Also my will is that my Executor shall pay hearely after my decease unto my sonne Joseph and to my daughters Sarah and Mary five pounds apeece in corne or cattle, beginning the first payment in Aprill 1657 [altered from 1656]: the which payment of five pounds a peese Annually shalbe in part of the aforenamed fifty pounds apeece and I do hereby declare that it is mine Intent that the household goodes app[er]tayneing to each of my children shalbe in part of the said fifty pounds a peece. Also my will is that my daughter Elizabeth shall have liberty to choose in the first place her part of the household stuffe, the whole being first divided into five Equall parts. In witness whereof, I the said Robert Daniell [do] here unto put my hand and seale the day and yeare first above written. The wordes between the 12th and 13th lines within one whole yeare after their. Interlined before [the] signing and sealing hereoff. Also I do hereby [fur]ther declare my mind that the aforesaid forty shillings per Anno [sic!] to my wife shalbe payd yearly. The Apples at such [t]ime as they are gathered, and the wheate about the last of September. And the Executors are to deliver them [at] her house shee sending her mare or a horse for the same. Also what Tho: Fanning hath alre[ady] rec[eive]d is to be in part of his fifty pound legacy. Court records entered and recorded on October 2, 1655; show that Robert Daniell left a sizable estate to his wife and children. The inventory made after his death provides us with a clear picture of man who prospered during his 19 years in the colony. 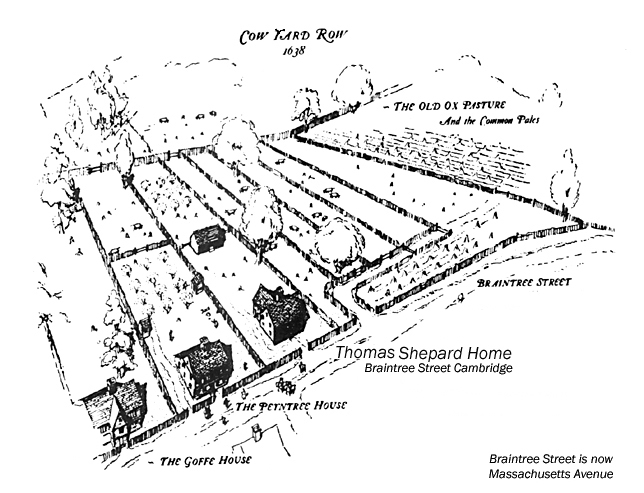 Robert had amassed 154 acres located in various areas about Cambridge and Watertown that were used to grow crops and support his livestock with hay and pasture. The patchwork of fields, both near and far, could be managed using his horses and cart to transport tools and harvest. Robert's fields were made ready each spring using his oxen to plow and plant crops of "Indian" corn, wheat, rye and peas. Other fields were used to keep and feed his cows, pigs and sheep. However, it is uncertain how long it had been since he had used his sheep shears since he did not own sheep at the time of his death. His cows were branded to distinguish them from others when left to graze in his fields or on the Common. Robert or members of his family made cheese and butter from the milk. The inventory shows that he had much more than they could possibly use so it's likely these products were sold to others in the colony. Robert also brewed his own beer using malt and wheat. His mansion home was not a log cabin since no one from England was familiar with that style of house construction until the settlers from Scandinavia would intermingle many, many years later. His home would have been fashioned after the homes colonists left behind in their homeland. Using a timber frame, wattle and daub and quite likely a roof made of thatch they would look much as they did in the villages and towns in 16th century England. It would be discovered that thatch roofs were not practical since straw grown in the colony was inferior to what was necessary and winters were far too severe for their continued use. These conditions lead to the replacement of thatch with wooden shingles or shakes. Clapboard siding was added to exterior walls since major temperature changes would cause the wattle and daub to crack and crumble. Interior spaces would have been divided into rooms and if a central chimney was built an inhabitable loft or completed second floor. Robert owned the necessary tools to build a home and furniture. Gages, hammers, crosscut and hand saws, chisels, files and a plane were on hand when needed. Firewood was cut using axes. A well-stocked kitchen with foodstuffs and the necessary kettles, pots and pans were made to prepare meals served on plates made of pewter. Robert was educated to a level to where he could read and sign his name. With these skills it's very likely that he could write as well. He owned several books, all dealing with the subject of faith and religion. A great bible, a book of psalms and works by Puritan pastors were likely read during quiet times in his day or evening. Robert could mark the passage of time using his hourglass and read or stay up late into the night using his lanterns and candles to illuminate the room. Robert's death was not expected since 5 new pair of shoes was recently added to his existing 5 pair. Thomas Fanning, husband of daughter Elizabeth appear to have moved in to the homestead located in Watertown as a rent payment was due to Robert at the time of his death. Among the many items Elizabeth received was one of the two spinning wheels, cooking pans and a deck of cards. NOTE: A complete inventory was required after Robert's death. Robert's original 13-acre Watertown lot was next owned by son, Samuel with the two remaining lots being owned by Robert's son-in-law, Thomas Fanning, husband of Elizabeth. It is unclear as to when this change of ownership took place; however, it's likely that it occurred sometime prior to Robert's death since there's a hint in Roberts will that Thomas had already received "part of his fifty pound legacy". Samuel eventually moved on to Medfield at which time his lot was acquired by Thomas, as well. It's unlikely that the youngest children remained with Reana after Robert's death. Note: The records show Samuel, Joseph and Mary, eventually moved to the Medfield area. Middlesex County Court records show that on April 7, 1657, Joseph Daniell, then 19, chose Robert Parker of Cambridge, as his guardian. Reana Daniell married Elder Edmund Frost (Elder was mentioned as a beneficiary in Robert's will many years earlier) of Cambridge prior to December 15, 1665. A land record states the relationship. MLR 4:80-82. Reana Frost died sometime prior to January 3, 1675/76 since a recording of Reana Frost's estate was taken on that date. Her estate was valued at 78 pounds 10 shillings. I have placed this section at the end of my writings about Generation I, Robert Daniell since there is no way to place it in any chronological context within the document above. This church and its membership are woven into the fabric of what was Robert's life while in the Colony. It's not surprising since many that left England's shores did so to escape the enforced trappings of the state sponsored church. Why else would so many leave family and friends and all things familiar? During his time in Cambridge, Robert Daniell was a member of the First Congregational Church in Cambridge, where Reverend Thomas Shepard served as an inspirational Puritan pastor. The church, then located at Mount Auburn and Dunster Streets was a very important part of Robert Daniell's life. It is at the church that he and many friends and neighbors who touched his life would worship the Lord. Additional church members included neighbors Mr. and Mrs. Gilbert Crackbone and Mr. and Mrs. Thomas Parrish, John Bridge, Thomas Shepard credits Mr. Bridge for influencing him to come to Newtowne (later Cambridge), and friends William Andrews and his wife Reana, (who would become Robert's second wife after the death of their spouses), Nicholas Wyeth (who eventually purchased Robert's home after the death of his wife Elizabeth), Isabell Jackson, wife of his close friend Richard and dear friend Edmund Frost. Edmund was one of the first members of the First Congregational Church of Cambridge and was installed as its first Ruling Elder February 11, 1636, and was reported to have great spiritual influence over many including his dear friend Robert. Also known by many church members were Robert's friends Richard Jackson and Thomas Danforth. Included in Robert's library were a great Bible, a book of Psalms and a volume titled y Soules Conflict.